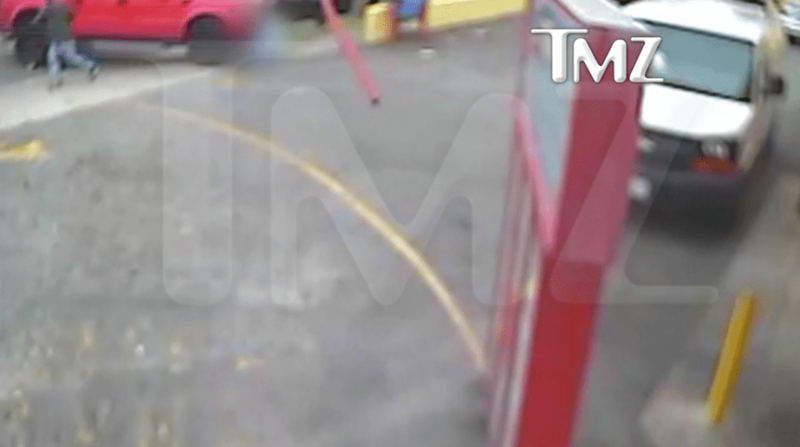 This still is taken from hit-and-run footage posted by TMZ in 2015. LOS ANGELES (CN) — The fiancee of former rap mogul Marion “Suge” Knight was granted a slight reprieve Wednesday when a judge reduced her $2 million bail to $500,000 on charges of violating a court order by selling video evidence to TMZ. Superior Court Judge Douglas Sortino reduced the bail after a lengthy hearing for Toi-Lin Kelly, in court in an orange jail jumpsuit. Describing the allegations as “troubling,” Sortino nevertheless said that a $2 million bond was more in line with bail for murder charges than for violating court orders. “I can’t in good conscience justify $2 million in this case,” Sortino said. He reduced bail to $500,000 noting that this is still more than 10 times the $45,000 that is typically set for such charges. Los Angeles County prosecutors accuse Kelly and Knight’s business partner Mark Blankenship of brokering the sale of a video of Knight’s alleged hit-and-run at Tam’s Burgers stand in Compton on Jan. 29, 2015, to celebrity gossip site TMZ for $55,000. Kelly, the mother of Knight’s 7-year-old son, says she is not guilty and that several lawyers gave her the OK to broker the sale. Superior Court Judge Ricardo Ocampo had issued a protective order barring public release of the video after Knight was arrested and charged with murder after plowing into Terry Carter with his pickup and critically injuring Cle Denyale “Bone” Sloan at the burger stand in Compton. Prosecutors say Kelly and Blankenship negotiated with TMZ for almost a month and knew that the evidence was subject to Ocampo’s protective order. They say the two started to negotiate the sale within two weeks of the incident. Kelly wrote to TMZ in a Feb. 12, 2015, text message, “I can’t wait to get this video to you,” according to the grand jury indictment. After what appears to be some haggling over the price, Kelly sent a March 5 email giving the go-ahead for a $55,000 sale. On March 9 that year, TMZ posted the 2-minute video on its website. The bail-review hearing began Tuesday morning at the criminal court in downtown Los Angeles. Kelly’s criminal defense attorney Dmitry Gorin challenged Kelly’s $2 million bail as arbitrary and excessive. But Deputy District Attorney Stefan Mrakich warned that Kelly was a danger to the public, and said she had spoken to Knight from jail in violation of a court order restricting calls to his attorneys. She also was under investigation for witness tampering and there is a “strong suspicion” of ID theft relating to financial documents found during a search of her home, Mrakich said. He told the judge Wednesday that he believed that Kelly’s goal was to get Knight acquitted of the murder charge. “That in effect makes her an accessory to the crime,” Mrakich said, asking Sortino to reduce the bail to no less than $1 million. Before ruling, Sortino heard from LA County sheriff’s Sgt. Richard Biddle, the lead investigator in Knight’s murder case. Biddle said that he searched Kelly’s home after obtaining a warrant, and seized $3,500 in cash from a bedroom closet and evidence of cashier’s checks for $25,000 and $35,000 from the TMZ production company, EMH Productions, made out to Kelly. Biddle said he found financial statements for a Charles Schwab account belonging to Dennis Northcutt. According to Biddle, Kelly had created white sticker labels printed with her name which she placed over Northcutt’s name. The financial papers were photocopied to make it look like they belong to Kelly, Biddle said. Biddle said he had not been able to make contact with Northcutt and Sortino noted that Northcutt has submitted a character reference in support of Kelly. Biddle said Kelly and Knight had played a “cat-and-mouse game” in which Knight would announce a legal call on a jail phone when he was actually talking to his girlfriend. As part of the ruse, Kelly would pretend to be Knight’s attorney, Biddle said, and Knight would call her by his attorney’s name. In a three-way call that Biddle listened to, he said he heard Kelly and Knight “intimidating if not threatening” a video expert who’d told them he could not enhance the video to identify an object that Knight hoped would show that the men who approached him at Tam’s Burgers were armed. During cross-examination, Gorin asked Biddle if the video expert or any of the alleged victims had made formal complaints or if authorities had filed charges. Biddle said that to his knowledge there were none. Biddle also told the court that Kelly had denied intimidating witnesses and that at least three attorneys had told her it was OK to sell the security video. “This is an attempt by the prosecution to take Suge Knight’s girlfriend off the street with an arbitrary bail amount,” Gorin told Sortino Wednesday afternoon. Outside the courthouse, Gorin said he respected Sortino’s decision and that the judge had given his client “fair consideration,” and the ruling was reasonable. Turning to the allegations, the defense attorney said Kelly was not part of any court order and that he had never seen a case like this in 25 years of practicing law. “We’re optimistic we’re going to get a fair shake in court from a jury and we’re looking forward to demonstrating in court that she’s not guilty,” Gorin said. Kelly’s mother Cathy Kelly-Walton and other family members sat in the courtroom during the two days of proceedings. Kelly smiled at her mother as she took her seat at the Wednesday hearing. Mrakich said he could not comment beyond verifying details that were disclosed during Biddle’s testimony. Knight, 52, the former CEO of Death Row Records, has pleaded not guilty to murder and attempted-murder charges that stemmed from a disagreement during a promotional shoot for the NWA biopic “Straight Outta Compton.” He says he was acting in self-defense after Sloan approached him at the window of his vehicle and claims the security video shows that Sloan was armed. If convicted, Knight faces a life sentence in state prison. His trial is expected to begin next year. The protracted legal saga now includes claims that Knight threatened the “Straight Outta Compton” director and that his former criminal defense attorney Matthew Fletcher was involved in the potential tampering with witnesses. The parties are expected to return to court on Monday, Sept. 25, for a hearing to determine whether the source of Kelly’s bail comes from a legitimate source and not from the proceeds of the TMZ sale. If convicted, Kelly and Blankenship each face up to three years in state prison on one felony count each of conspiracy to violate a court order, conspiracy to obstruct justice and conspiracy to commit grand theft.